One thing I love about the vocaloid franchise is the diversity of the versions or costumes of the characters. Each song is unique and in each song the vocaloid characters play a different role. It’s as if in every original music video they’re in a mini movie of their own. Looking through a whole bunch of seasonal themed cosplays everyone has started uploading, one particular version of a Hatsune Miku cosplay piqued my interest. 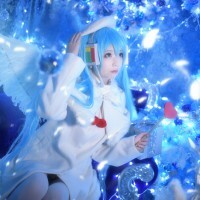 This is a winter-themed version of Hatsune Miku was created by Chinese cosplayer, Izasaki. Izasaki is a fan of varied anime genres such as Fate/Stay Night, Durarara, Hell Girl, Bleach, etc. and has cosplayed characters from these animes. They say with vocaloid, everyone is a creator. In the same manner where the music composers and talented artists become the creators of different vocaloid versions, it seems cosplayers have showed that they too can be creators too!